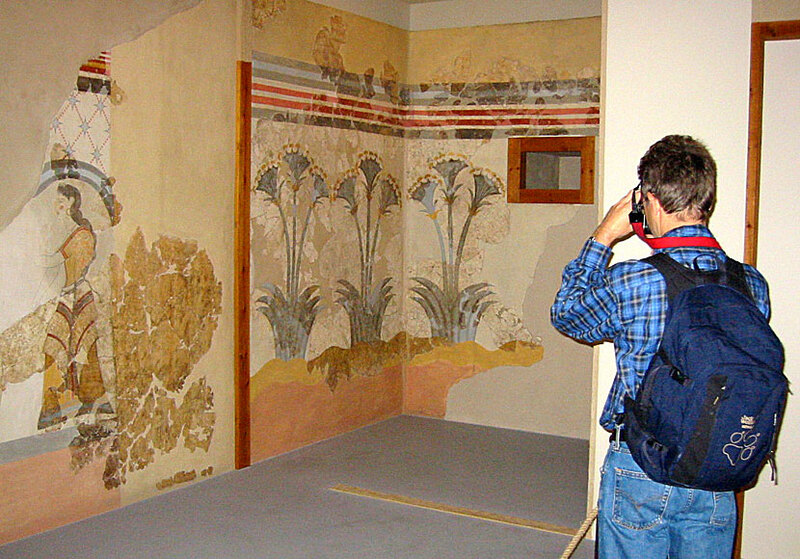 The excavations in Akrotiri and wall paintings at the Museum of Prehistoric Thira. Akrotiri is Santorini's main attraction, and one of the most important archaeological sites in Greece. Before the enormous volcanic eruption around 1625 BC, Akrotiri was a thriving Minoan village with an important commerce activity with for example Crete. But the village had a drastic ending, the volcanic eruption buried Akrotiri in huge amounts of lava, like the rest of the island. As you can see, it is a large excavation area. Akrotiri was rediscovered a few thousand years later, more specifically in 1866, when pots and vestiges of a settlement was found in the area. Serious excavations did not start until more than a hundred years later. They were led by Professor Spyridon Marinatos who had decided to prove his theory that the volcanic eruption of Santorini was the reason why the Minoan culture fell. Ironically, Marinatos fell badly in 1974 during the excavations and the fall led to his death. He was buried in the excavation area, which was his life's work. 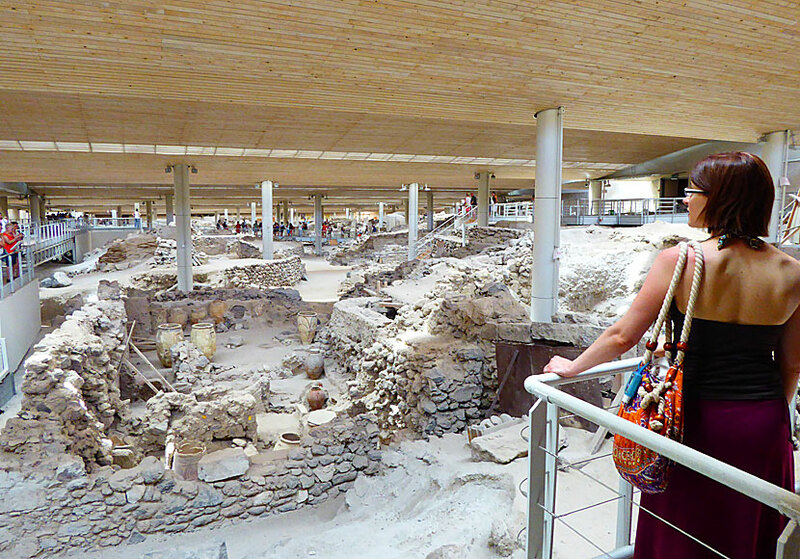 At the site you can study how people lived in Greece during the Minoan period. It is not without one being impressed by the structural engineering from those days. Some houses are three storeys high and it was not unusual to have running water indoors. Few valuables or jewelleries have been found during the excavations, and there are not any vestiges of bones from humans or animals, for what reason it is believed that the villagers were warned about the eruption and managed to reach safety. Probably they fled to Knossos in Crete. Archaeologists have recently revised the time of the eruption, it is now believed that the eruption occurred as early as around 1625 BC. If so it would mean that the eruption had nothing to do with the destruction of Knossos or the fall of the Minoan culture. Previously it was thought that the eruption occurred around 1450 BC. 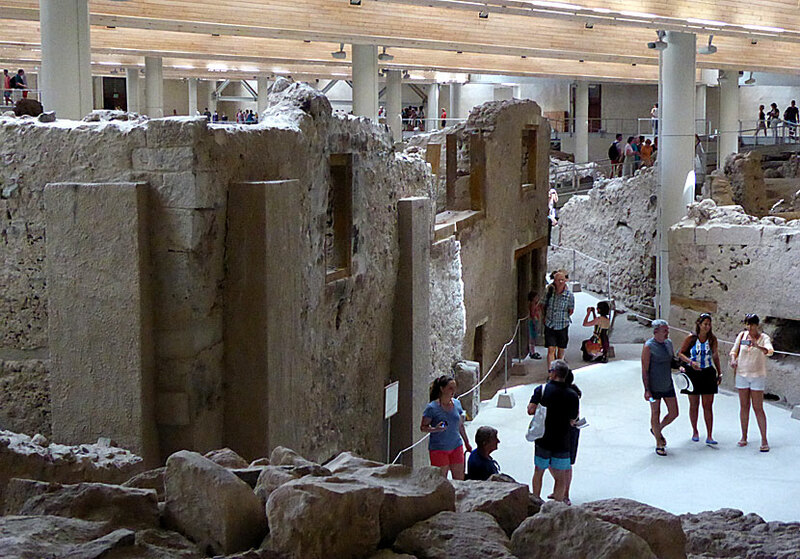 Even if you usually are not interested in archaeological excavations you should visit Akrotiri. The easiest way to get here is with your own transport. If you choose to go by local bus it start out from Fira, you can also go on an organized bus excursion, check with your tour operator or with any of the travel agencies. The excavations is located a few kilometres south of the village of Akrotiri. Open every day from 10:00 to 17:00. When you finish the round trip, you may need to cool off. What luck that Red beach is near Akrotiri. Some of the houses that almost survived the volcanic eruption. 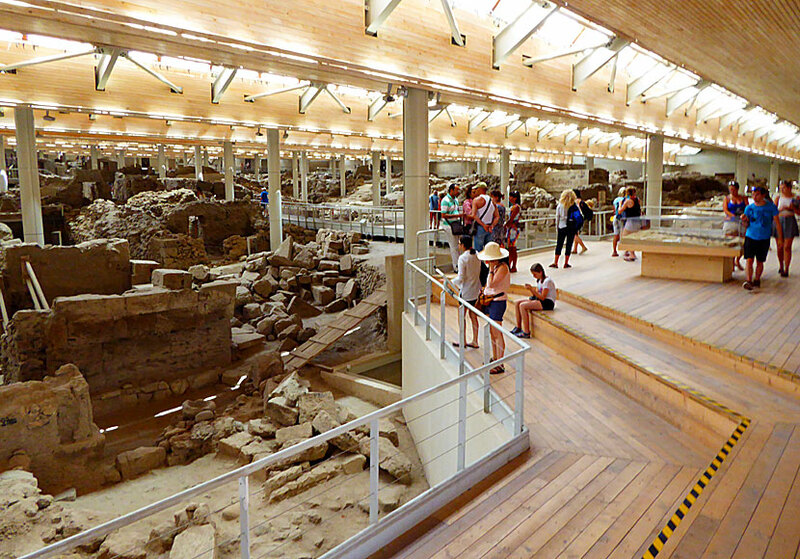 When you have seen the excavations in Akrotiri, I recommend a visit to the Museum of Prehistoric Thira. This pleasant museum houses findings from Akrotiri and lies just before the square (Main Square) in Fira. Unfortunately, a considerable part of the findings from Akrotiri are on display at the National Archaeological Museum in Athens, but the museum is still worth a visit, for example it exhibits several marvellous frescoes and unique ceramic vases from Akrotiri. Museum of Prehistoric Thira in Fira. The frescoes of Akrotiri is nearly world famous, copies of Boxing Youth and Fisherman is available for purchase everywhere in Santorini. The Museum of Prehistoric Thira is open from 08:30 to 15:00 every day except Mondays.